I was reminiscing stories from my childhood and the toys that I used to have this weekend, which led me to an endless search on YouTube for toy commercials from my youth. In my search, I had an epiphany. My passion for cars was instilled in me at a much younger age than I remembered. I’ve always told friends that my love for cars began around age 10 when my dad and brother restored a Porsche 911 Carrera. But I realized this weekend that it started long before then. I can remember at four years old receiving the most glorious Christmas gift. At age four, I don’t think I was asking for specific gifts, but having a brother six years my senior meant that I pretty much liked whatever toys he liked – Lego’s, Transformers, Hot Wheels, etc. My parents have always divvied up our presents for Christmas and birthdays, labeling them from either “Mom & Dad” or “Mom” or “Dad.” I guess it was their way of identifying one of them as putting special thought behind selecting certain gifts for us.I don’t remember the wrapping paper or what the label said, but Dad’s name was all over “it” – the gift that started it all. That Christmas, in 1987, I opened a shiny, red Ferrari for my Barbie. It had chrome wheels and tan leather interior. The targa top was off (mainly so that Barbie could enter and exit) and the license plate read “BARBIE.” Talk about being car chic! My Barbie was going to ride in über style. I can remember spending time that night (we got to open a few presents on Christmas Eve) delicately placing the taillight decals onto the shiny red plastic, making sure that we fit them perfectly in the grooves Mattel left for us. Six years before my father and brother ever really talked about cars, I was forming an attachment to them. I was the only girl who didn’t have Barbie’s dream mansion but did have four cars for her prized dolls. The subsequent vehicles included a Jeep Wrangler for beach cruising and a very classy 1957 Chevy Bel Air convertible – stocked with pink interior and a working trunk. 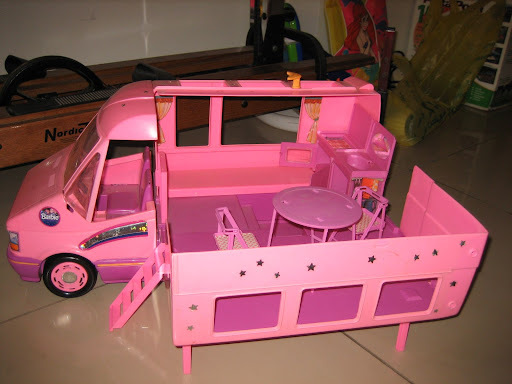 The final vehicle purchase was an awesome motor home that opened up so Barbie could sleep and eat when taking a break from traveling the rough road across America. But despite having four vehicles in her collection, Barbie (I mean, I) seriously loved that Ferrari. I played with it religiously until the “Day of Irreparable Damage.” While driving down imaginary Rodeo Drive, a wheel came completely free from its axle, nearly ejecting Barbie through the targa top (good thing she was wearing her seatbelt!). I gasped. She gasped. It was tragic. I called in the repair man (i.e. Dad), but there was nothing he could do for me or Barbie. Completely immobilized, the Ferrari would have to be laid to rest, destined to a lifetime in the Barbie junkyard. In addition to my “age I began to love cars” epiphany, I realized after something else this weekend. For years, I had been belittling my Barbie Ferrari, telling friends about my first red Barbie “Corvette.” Searches online told me, however, that Barbie Corvettes only came in pink. The circular taillights must have led me to remember incorrectly. Regardless of failing to remember the right sports car (I mean, who would think they’d make a Ferrari for Barbie? ), the memories of my childhood passion for autos are vivid and full of gleeful days wheeling Barbie and Ken around in style. People spend a lot of time in their cars. According to a Distractify.com survey, the average American will spend 4.3 years of their life driving a car. We’ve all got different driving styles and habits, and you’ll soon learn a lot about them. Barbie and Ken! Now who would have ever thought that your inspiration would come from a pair of dolls? Then again, when it comes to children and toys, what we love as youngsters often will set the pattern for our lifelong interests.